Sarah contributes articles and talks from time to time in other contexts. She also writes a blog which emerges from her regular Wednesday retreat days. Benedictus is part of the movement of contemplative renewal in the Christian church today. We draw particularly on the teaching of meditation offered by the World Community for Christian Meditation, but we welcome those who practice silent meditation according to other strands of the tradition. A sense of our unfolding journey is conveyed in Sarah’s Pastoral Letters. The link to the World Community for Christian Meditation allows further exploration of the teaching of John Main and Laurence Freeman, and gives access to the resources offered by that community. The link to Contemplative Outreach allows exploration of the teaching offered by William Meninger, Basil Pennington and Thomas Keating, often known as ‘Centering Prayer’, which is the other major expression of the Christian contemplative tradition to have arisen in the 20th century. A compelling statement of the centrality of contemplation for Christian life and worship was given by then Archbishop of Canterbury Rowan Williams in an Address to the Synod of Bishops at Rome in October 2012. 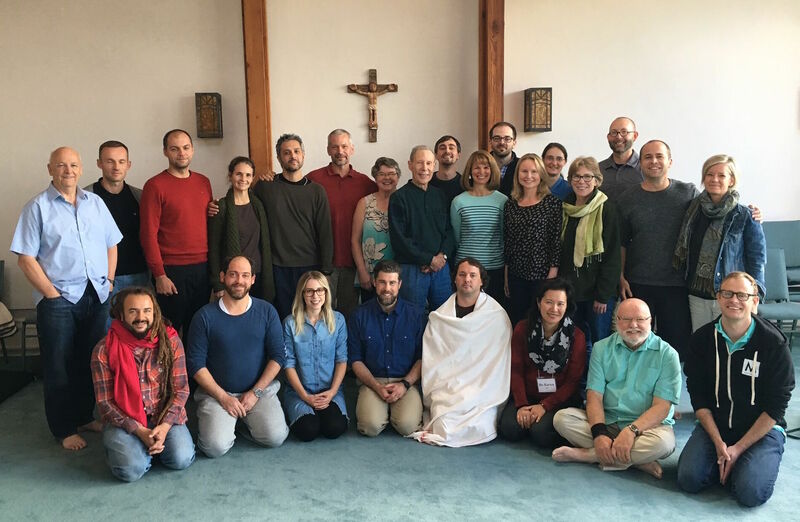 In August 2017, Sarah participated in a gathering of twenty contemplative scholars and practitioners from seven countries, meeting at St Benedict’s Monastery in Snowmass, Colorado. This was an extraordinary meeting in an extraordinary landscape, as evident from the photograph above, taken on the final day by Czech priest and WCCM participant Vladimir Volráb. The intent of the meeting was that it be an exchange among ‘young contemplative thought and practice leaders’ with the hope that ‘their mutual stimulus can bring fresh, Spirit-inspired imagination to the ways contemplation can be understood, practiced and spread in our time, in ecclesial, educational and other institutional and communal contexts’. A video about the gathering is available here, and Sarah’s reflection on the gathering is available on her Wednesday retreat blog. Awakening a larger embrace and expansion of Christian contemplative understanding and practice as the vital grounding of Christian life, with openness to collaboration with all streams of contemplative wisdom, in response to the urgent social and spiritual needs of our time. It is an exciting privilege for Benedictus to participate in this movement of contemplative awakening, as we continue to discover and live out our own vocation in community.